Failure to clean the concrete timely after the pump truck operation will result in serious cover of the important parts such as transmission box, reducer, hydraulic oil tank, hydraulic radiator and main valve block, which will result in various performance obstacles. According to the structure of the small concrete pump truck, each power part of the small pump car will generate high temperature and high pressure when operating, which requires the thermal conductivity of the equipment itself to dissipate heat, or auxiliary radiator heat dissipation (such as hydraulic heat dissipation fan). Therefore, the uncleaned concrete will inevitably affect the thermal conductivity of these components. The transmission of the small concrete pump truckcan rely on its own design for reasonable heat dissipation. Can produce water vapor transmission in the process of work, after a large number of gas accumulation can make internal pressure rise, gearbox design a breather hole at the top, fundamentally speaking, the air holes is actually a one-way valve, under normal circumstances, the valve is closed, and when the internal pressure rises, one-way valve will be open to discharge water vapor. But if the valve is foreign bodies concrete pump truck unable to return to the start state, can make the internal mixed gas transmission cannot normal pressure, the performance of the transmission oil will be severely affected, lubrication performance is impaired, the performance of the transmission oil transfer power down, and then make the clutch plate skid, high oil temperature rise, lead to the generation of water vapor and even cause a boiling oil/water mixture. The failure of water vapor to discharge normally results in accelerated dilution of gearbox oil and a series of malignant causes such as blockage of valve body caused by the accumulation of diluted substances in the valve body, thus affecting the control system of the whole gearbox. All kinds of dirt and debris cover the top of the hydraulic oil tank, the water proof flange at the feed port of the hydraulic oil tank is completely damaged, and the pressure gauge, oil pipe, platform and other parts of the oil return filter core assembly cannot see the original appearance. These stains cause secondary damage to subsequent maintenance. Add hydraulic oil and replace the tubing with cement sand. The oil pressure, oil return and other filter elements are blocked, and the oil transfer amount of the oil pump is insufficient. The oil pump is in the state of insufficient oil supply for a long time, resulting in oil pump damage. 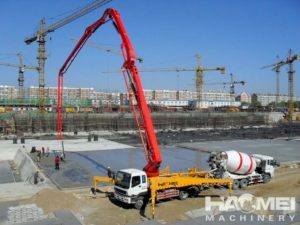 In summer, the equipment of the small concrete pump truck is under high temperature for a long time. If the hydraulic oil cooling fan of the small pump truck cannot work effectively, it will directly cause the heating of the hydraulic oil. If the temperature of the hydraulic oil is higher than 82 degrees, it will accelerate deterioration. When the temperature rises, the viscosity of oil decreases, causing the hydraulic equipment to wear out, and at the same time, leakage may occur, which reduces the viscosity of the hydraulic oil, weakens the lubricating ability, damages the sealing parts, causes bad lubrication, and causes the hydraulic components to wear.